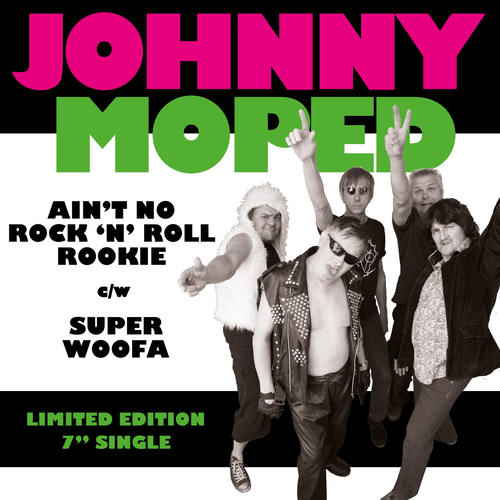 It’s a double A-side of ‘Ain’t No Rock N Roll Rookie’ and ‘Super Woofa’ and will be out on July the 31st followed later in the year by their new, long awaited album. Look out for them supporting the DAMNED on the 6th June and up at Rebellion for the first time too. Johnny Moped are an English punk rock group from south London, who once had Chrissie Hynde (later of The Pretenders) and Captain Sensible (later of The Damned) within their ranks. Formed in Croydon in May 1974, the band were a proto-punk band. Initially calling themselves Johnny Moped and the 5 Arrogant Superstars, by August they changed their moniker to Assault and Buggery, then the Commercial Band, before reverting to just Johnny Moped by January 1975. Johnny Moped became one of the pioneering punk bands that played live in the first few months of London’s now-legendary Roxy Club. They played two gigs in February 1977, one supporting Eater and one backing The Damned. The following month they played two more, one supporting Slaughter & The Dogs and the other backing The Damned. In April, they were on a bill that included Wire, X-Ray Spex and the Buzzcocks. Johnny Moped’s "Hard Lovin’ Man" appeared on the hit various artists album Live at the Roxy WC2 (Harvest Records, 1977). The band signed with Chiswick Records and released three singles, including "Little Queenie" (a cover of the Chuck Berry song), and one album - Cycledelic - before splitting up. First single "No-One" later featured on the Chiswick various artists sampler album Long Shots, Dead Certs and Odds On Favourites in 1978, while b-side "Incendiary Device" made number 15 in BBC Radio 1 DJ John Peel’s ‘Festive Fifty’, the so-called ‘lost list’ of 1977. Sixteen years after its release, the publishers of The Guinness Encyclopedia of Popular Music, named Cycledelic as one of the best fifty punk albums of all-time. Most of the band reformed to record a second album The Search For Xerxes in 1990.